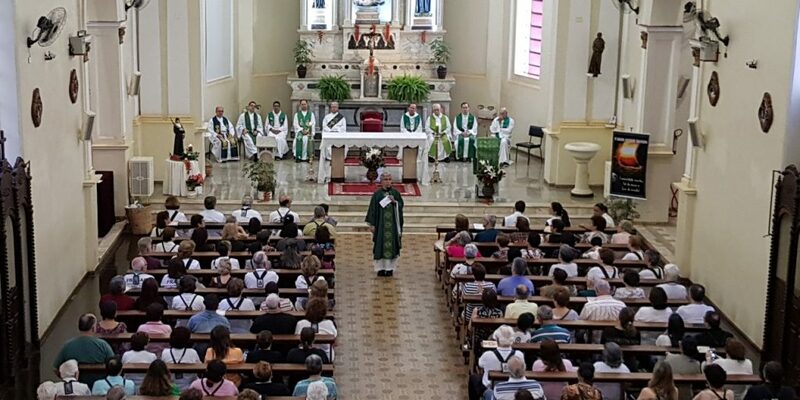 Sao Paolo, BRAZIL – The Secular Augustinian Recollect Fraternity of Brazil celebrated its 11th National Convention with St. Augustine’s vision on the laity as the main theme for reflection from November 15 to 18. It was the first ever Convention right after the completion of the process of the Order’s restructuring. Fraternity implies a daily and continuous commitment. It is something that was evident in the aforesaid SARF Convention in Brazil that took place in Ribeirão Preto, Sao Paolo. More than a hundred lay members of the SARF lived first-hand in community for four days, reflecting the ideal of St. Augustine. This was precisely the main theme of the Convention, the first after the culmination of the Order-wide process of restructuring in which the SARF members as well as the religious who previously belonged to the Provinces of Saint Rita, St. Joseph, and St. Thomas of Villanueva were united in a single Province. Fray Danilo Jnagitz, OAR explained how this process of revitalization had taken place. Priests, religious, and SARF members from all over the country assembled in Sao Paolo with the aim of reflecting, praying and living together in community. The principal theme, the laity according to St. Augustine, was presented by Fray Nicolás Pérez, OAR, the first speaker of the meeting. He recalled that Jesus makes everyone salt of the earth and light of the world. Fray Mario Aparecido, OAR, also spoke to the lay Augustinian Recollects about this subject. He dwelt on the role that lay people should have in the Church. In the framework of the National Year of the Laity celebrated by the Church of Brazil for 2018, Sis. Juliana, a SARF member of Ribeirão Preto, expounded the objectives set for this year. On this account, the reflection revolved around “being” a lay Augustinian Recollect. The St. Joseph Parish in Sao Paolo was the venue chosen for the celebration of the Closing Mass of the national assembly. Fray Nicolás Pérez presided over the Eucharistic Sacrifice. He thanked the participation of the different SARF Chapters: Belém do Pará, Castello (Espírito Santo), Vitoria, Cariacica, Rio de Janeiro, and Sao Paolo.